Bushmaster Jackal & Wolf Folder / Bowie Knife Set with Sheath | BUDK.com - Knives & Swords At The Lowest Prices! Rugged mountains. Dense jungles. Endless steppes. No matter the environment, no matter the locale, with Bushmaster's "Jackal & Wolf" Two-Piece Knife Set leading the way, you can pierce the impenetrable, hack apart the indestructible and cleave through the indivisible. This powerhouse set boasts myriad capabilities and affords numerous cutting options via two capable knives - a hefty fixed blade bowie (the "wolf") and a versatile folder (the "jackal"). Each knife features a razor sharp 420 stainless steel blade with a rugged black coating and a heavy duty molded polymer handle, carefully formed to yield sleek lines, fluid curves and an ergonomic hand-feel that's second to none. For all their similarities in quality and design, both knives bring their own unique capabilities and fortes to the table. Take the bowie, aka "the wolf" - its 9" clip point blade is sharp and robust like its folding counterpart - "the jackal" - but it adds a useful twist in the form of potent serrations on the spine. This craggy sawback is perfect for ripping through tough materials like wood and rope fiber. The "jackal" folder offers one-handed operation and the ability to tackle a wide range of jobs, from fine detail work to tough carving and clean slicing. Thanks to its handy ambidextrous thumb studs and flipper, you can quickly and easily deploy its 3 1/2" drop point blade with just a flick of the wrist. 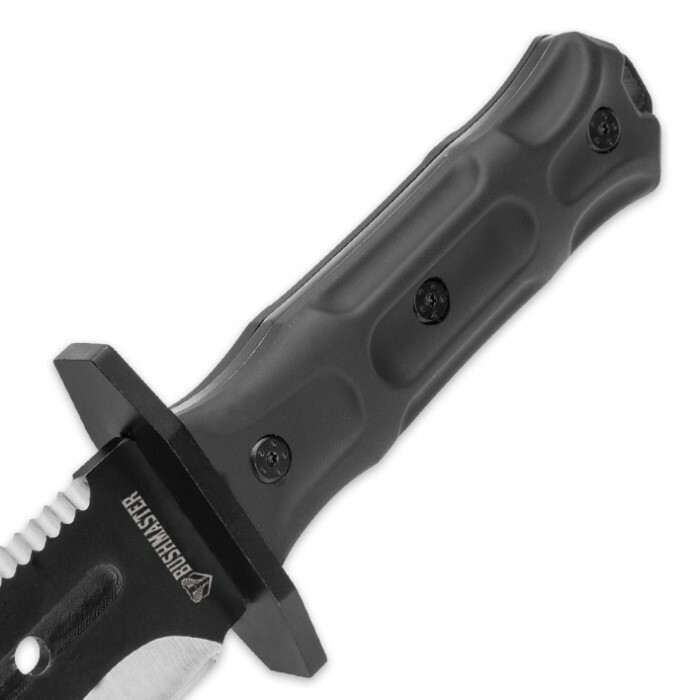 Housed together in a single reinforced nylon sheath, both knives are secure during transport yet easy to access at all times. The sheath includes tough paracord looped through two lanyard holes, a belt loop and a web of nylon strapping for multiple carrying options. 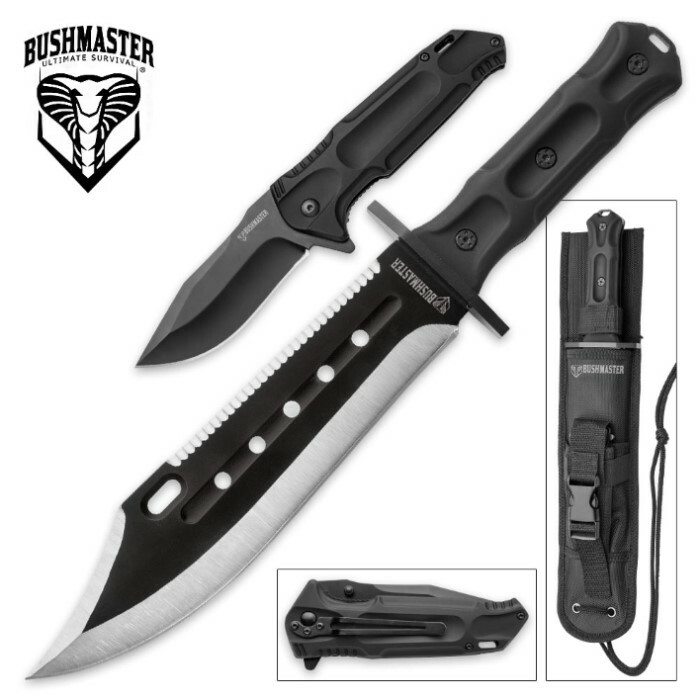 Developed especially for serious outdoorsmen and tactical gear enthusiasts, the Bushmaster "Jackal & Wolf" Knife Set is perfect for demanding excursions in extreme environments. Don't entrust your life or limb with anything less!